An action-adventure stealth game that takes place in the 14th-century France, consumed by the Black Death. The main protagonists, Amicia and her five years old brother, are trying to find their mother. A Plague Tale: Innocence is an action-adventure stealth game developed by Asobo Studio from France. One of the games the studio previously worked on is ReCore. The new game was released on many platforms. 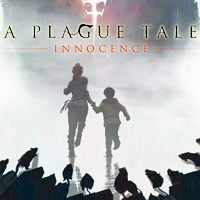 A Plague Tale: Innocence takes place in France in year 1349, during the times when the citizens of Europe had to face the Black Death – one of the largest pandemics in the history of mankind. Two main protagonists of the game – Amicia and her younger, five years old brother Hugo – must live in such reality. The story focuses on relations between the protagonists who are trying to find their lost mother. In order to achieve their objective, the siblings must get through the ruined, dangerous city patrolled by members of the Inquisition and plagued by groups of hungry rats. The action in A Plague Tale: Innocence is presented from a third-person perspective. During the game the players control only Amicia while her younger brother is controlled by artificial intelligence. The boy frequently helps his sister – his small size enables him to reach hardly accessible places. This becomes useful while solving environmental riddles. The kids are unable to defend themselves – Amicia only uses a slingshot that can be used to distract people on her way and to manipulate the surroundings. One of the main gameplay features is sneaking pass by armed opponents that can easily kill the protagonists. The stealth mechanics are unusual – the siblings can’t hide in the shadows because there are rats there. The players must remain in the light while at the same time they must destroy lamps and candles of the opponents – this makes them vulnerable to the rats. A Plague Tale: Innocence features high quality three-dimensional graphics. The developers focused on realistically recreating the behavior of the rats – they can immediately move from one body to another, they actively avoid light and they fight with each other for their prey. Despite the presence of child protagonists, the game is quite brutal and the view of mutilated bodies is a regular thing.